This was a fun one to put together! Love my breakfast sandwiches, but as always was very messy. So there is a funny story behind this recipe packed post (yes, more than one recipe to follow). When Barilla came out with their comments last year against a “non-traditional family” I decided f-$k them, I will never buy a Barilla product again. But there are some pasta products, like manicotti and shells, that are tough to find in the store not made by Barilla. I wanted to make a manicotti dish for The Veganaut and I earlier this month, but the store again only had Barilla products. So I went home pasta-less, and went to amazon.com instead. There I found a vegan, non-Barilla box of manicotti for $3 and bought 2 of them. Fast forward later that week when they arrive, and it turns out I actually bought two cases….so what to do with 12 boxes of manicotti?! 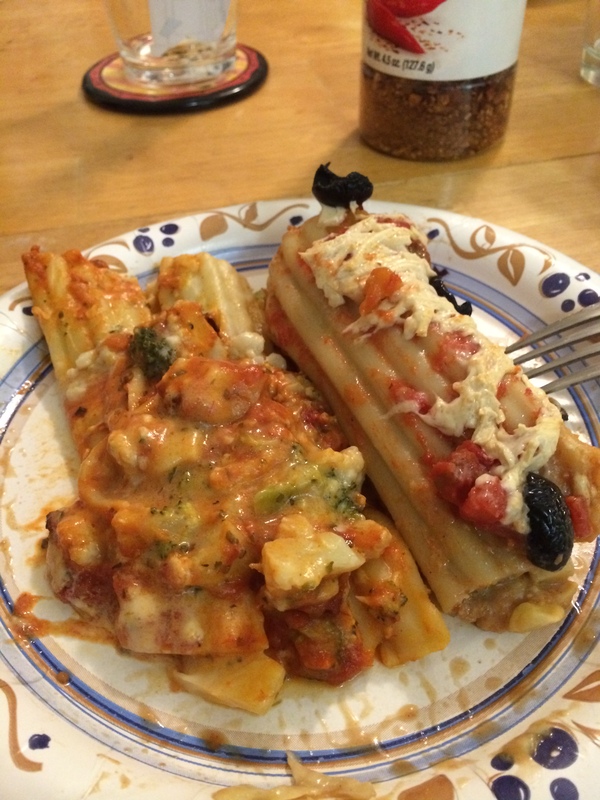 Why have a party that is manicotti themed of course! I went on a camping trip with a friend earlier this summer, and we both brought a large amount of food to the event even though there were just two of us. Naturally I had a lot of leftovers to take home, but most of the goods were non-perishable. This includes two bags of dried fruit, one was banana chips and the other being a mixture of dried mango, pineapple and cranberries from Trader Joe’s. These were sitting in my cupboard for months but I finally made use of them: chocolate covered fruit clusters! Maple Syrup Encrusted Rainbow Brussels Sprouts! Ok, so this is not really rainbow colored brussels sprouts, but it looked rainbow-ish when completed, hence the title. The Veganaut and I had a large amount of maple syrup shipped from his mother to us this week, so I wanted to make some unique recipes with it. Here is my first! Sorry I haven’t posted in a bit. The Veganaut and I were enjoying an amazing weekend in Napa, and last week I mostly cooked recipes that I have already shared, just ones that I love so much I had been meaning to repeat making them. But I’ve got a couple new recipes for you this week. On a good note for me I am recovering well after my ACL surgery and will be back to work this Friday, but what that means for you is that I will only be cooking, and therefore sharing, 1-2 recipes a week at most. But of course the Veganaut will hopefully make up for that as he will cook on many of my work days. Today I want to share this homemade mushroom ravioli dish. I have tried to make homemade vegan ravioli before and it was always an epic failure (i.e. fell apart/dissolved while boiling in the water). I am happy to report that this recipe survived being cooked, though it was by no means perfect. This was a fun recipe to make for sure, and ended up being a super packed pizza! I tried a new vegan enchilada recipe this week. Enchiladas, and variations on Mexican dishes like tacos or tostados are some of my favorite recipes. I make a mean sweet potato and black bean enchilada, and The Veganaut has this incredible vegan enchilada recipe. So I wasn’t sure how this different recipe would hold up, but I was definitely happy with the results. This was another recipe attempt at using apples non-conventionally. I found the original recipe here and made some of the following modifications to make it my way, as well as completely vegan. Modified my last one with some ingredients in the house for another tasty apple breakfast hash. Wow I did a good job on this recipe. I have been struggling to make tofu that has the same consistency of what we all get in the restaurant. And for the longest time I figured I just needed to deep fry it to have that quality. But no, it is much more simple. The trick is to bake it! Yup! Here’s my latest Asian recipe, this one is by far the best one I have made yet.